Welcome to Gray Family Chiropractic, where our promise to you is that your health, comfort, and satisfaction is our primary concern. We look forward to welcoming you to our office and helping you reach and exceed your goals. If you have any questions, we would love the opportunity to answer them. 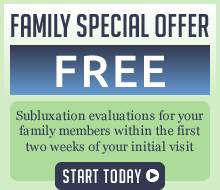 Call our Raleigh chiropractic office today! Upon entering our office you will feel removed from the hustle and bustle. We are situated in a cul-de-sac and our office is warm and inviting. We provide our office forms online, or we will be happy to fax or email them to you. After the paperwork, we will show you a short 7 minute video about chiropractic to familiarize you with what to expect. Next, Dr. Gray will perform a chiropractic spinal examination designed to detect for any vertebral subluxations, or spinal misalignments which produce nerve interference and disrupt health. Your doctor will palpate with her hands to feel the alignment of your spine moving it in different motions. On your second visit, the doctor will review your X-rays and determine a treatment plan individually designed for you based on your level of subluxation and severity. You will receive an adjustment and the whole process will take about 30 minutes. You can choose to schedule your future visits all at once or on a weekly basis. A typical office visit requires just 15 minutes. But don’t think the brevity of a regular visit lessens its value! With the groundwork laid, we can quickly size up the condition of your spine and nervous system, adjust you and get you on your way. We encourage our patients to participate in all phases of their care. Our purpose is to empower our patients and families to aspire to new levels of optimum health. Obtaining optimum health through chiropractic care is a continuous process. Like a regular workout at the gym, each visit builds on the ones before. Miss a visit and you can lose the momentum necessary to make the needed changes.